[Newsmaker] What are remaining variables ahead of NK-US summit? As North Korea and the US finalize preparations for their historic summit, expectations are rising that the June 12 meeting is on course and the leaders of the two countries will reaffirm their shared goal of denuclearization of the Korean Peninsula at the summit. 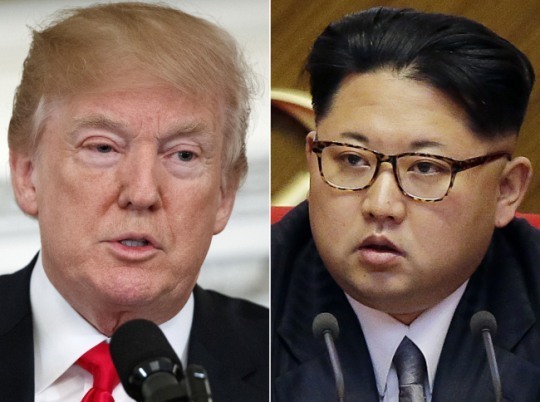 But with only days to go before the meeting, analysts say there are remaining issues that could still derail the on-again, off-again summit or lead to US President Donald Trump and North Korean leader Kim Jong-un walking away during their talks on June 12 in Singapore. The most significant challenge appears to be closing gaps on the timeline and process of North Korea’s denuclearization before the summit. “The biggest variable would be whether North Korea agrees to ship parts of its nuclear warheads, nuclear material and intercontinental ballistic missiles out of the country, and to allow robust inspections of the country’s nuclear facilities,” said Shin Beom-chul, a senior researcher at the Asan Institute for Policy Studies. Five rounds of working-level talks between the US and North Korean delegations have been held at the border village of Panmunjeom since May 27. The officials reportedly did not meet Tuesday. The two sides appear to agree that Pyongyang denuclearizes in return for a security guarantee from the US in a short period of time, possibly by 2020. But they still seem to be at odds over what should be front-loaded in the denuclearization process. Analysts say the US wants North Korea to agree to transfer some of its nuclear weapons and missiles out of the country within months. North Korea is thought to want the US to lift sanctions against it and begin taking steps to open diplomatic relations with the communist state. “The biggest variable to watch out for is whether the US can guarantee the level of protection North Korea desires. Unless North Korea makes concessions significant enough to persuade the US Congress, it will be tricky for the US to promise a security guarantee North Korea wants,” said Park Won-gon, a professor at Handong Global University. To give the level of protection North Korea wants -- such as sanctions relief, normalization of relations with the US and the signing of a peace treaty -- any deal coming out of the summit needs to be approved by the US Congress. Mindful of North Korea’s security concerns, US Secretary of State Mike Pompeo said that he hopes any deal reached during the summit is sent to Congress to be approved as a treaty -- a formal and written agreement between sovereign states. Treaties must be approved by a two-thirds vote in the Senate before the president can ratify it. Senate Democrats on Monday released a letter to the Trump administration outlining the parameters of what they believe constitutes a satisfactory agreement. Their demands include dismantling and removing the North’s nuclear, chemical and biological programs, a suspension of ballistic tests, and robust inspections. However, experts say the prospects of a deal brokered at the Singapore summit getting approval from the US Senate appear to be dim, unless the deal addresses North Korea’s human rights -- which the reclusive regime considers a threat to its regime and authority. With Trump expected to focus on getting a nuclear deal, concerns are mounting that North Korea’s human rights will be overlooked at the summit. Another issue that could complicate the high-stakes diplomatic game could be China, senior research fellow Shin said. North Korea has been seen using its relations with China as leverage in negotiations with the US and South Korea. North Korean leader Kim Jong-un met Chinese President Xi Jinping twice earlier this year amid a rapid rapprochement in its relations with the countries. Declaring an end to the Korean War is thought to be a precursor to ending hostilities and establishing a peace regime on the Korean Peninsula -- the first step to guaranteeing the North Korean regime’s survival. China has signaled its growing unease at being sidelined in discussions over a declaration of the end to the Korean War through its state-run media. Seoul’s presidential office has said that China could be left out of the process of declaring an end to the Korean War, but added its role is essential in signing a peace treaty with the North. There are speculations that a summit among North Korea, China and Russia could take place on the sidelines of the two-day summit of the Shanghai Cooperation Organization, an economic and security cooperation body spearheaded by China and Russia. It will take place in Qingdao, China, on Saturday and Sunday.